Guys, I did it again. Messed up a recipe. This is twice in two weeks, I want you to know. The first flop was when I thought I could make risotto without chicken stock. It was pretty disgusting. Not only did it taste bitter and weird, it came out a sick milky-purple color from the red wine I thought I’d try and use to flavor it up. This last mess up was bright green: usually attractive in a pesto, gross and bitter (once again) from lack of salty flavor. The risotto debacle was the result of me trying to “make do and mend” with items I already had in my house. The pesto travesty came from a shoddy recipe (or from someone who REALLY loves the taste of watered down arugula juice*). The (lovely and patient) BF tried to force down both dishes, but in the end I think his response was, “I don’t know if I can eat any more of this…” I feel like I have some serious mac-n-cheese-ing to do to compensate for these lost meals. 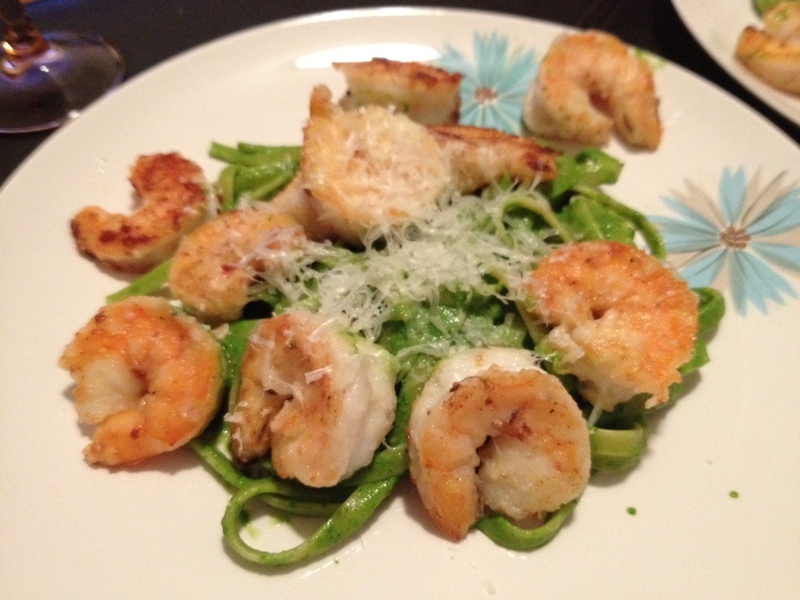 In any case, the shrimp in that above dish were INCREDIBLE so I’m including the recipe here. Totally worth trying with a regular pesto recipe or your standard tomato sauce. In a small bowl, mix together garlic powder, salt, and pepper. Make sure shrimp are rinsed clean and patted completely dry. Sprinkle seasoning over the shrimp. Place shrimp in a plastic Ziploc bag, add flour, and shake to coat. Heat olive oil in a skillet over medium heat. Shake excess flour off of shrimp and place in the hot skillet. Cook on each side for around 3 – 4 minutes, or until they are no longer gray and translucent. Add to pasta and sauce and grate cheese over the top. *In case you’re interested, the sauce in question was arugula pesto: 6 oz. of arugula, 1 garlic glove, 1/3 cup of asiago cheese, 1/4 cup olive oil, 1/3 cup heavy cream, all blended together.